October 8, 2018. I've been working on a theory of meaning fields, extending meaning beyond the human, with the first paper now published in EdgeScience, Volume 35, which you can read by clicking here and scrolling down to page 8. July 12, 2018. Recommended reading: How Forests Think: Toward an Anthropology beyond the Human by Eduardo Kohn (University of California Press, 2013). I read this book several years ago and am just returning to it to read the sections I highlighted and my margin notes. I like the way Eduardo feels his way into both the phenomenology and the scholarship of reaching beyond the human in an effort to understand representation, thinking, and meaning-making. June 22, 2018. The Academy for the Advancement of Postmaterialist Sciences, which I helped to found, is off to a strong start. Check it out here: http://www.opensciences.org/blogs/open-sciences-blog/introducing-the-academy-for-the-advancement-of-postmaterialist-sciences or here: https://www.aapsglobal.com/. May 17, 2018. Well, I updated my website today. I do that once a year when classes have ended. The main difference is on the "research" page where I summarized some of the current research projects. Several students have remarked that my web site is a bit "clunky" (my word, not theirs) implying that that were somehow a shortcoming. But a recent conversation with Charley Tart clarified that such "clunkiness" is actually beneficial because it helps to focus the reader's attention on the substance of the content of the website. Are Charley and I just rationalizing? Whether we are or not is irrelevant since I don't have time to improve the appearance of the web site anyway. Which reminds me of a comment that I read on the Internet several years ago by a pundit who complained that I had "no web presence" or something to that effect, making it sound as though that were a bad thing somehow. That made me laugh. I am here for those who can find me and need me. That's it. February 9, 2018. The Consciousness Conference is set to go on Saturday, March 3, 2018. Information about the conference, including a poster and the full program, with abstracts, can be found at this url: http://baruss.ca/cc.htm. December 13, 2017. I have created a web page for the Consciousness Conference, which can be found at this url: http://baruss.ca/cc.htm. December 8, 2017. Some students and I have organized a one-day Consciousness Conference here at King's for Saturday, March 3, 2018 for anyone who is interested. Here is the poster for it. November 3, 2017. I have a new paper published, titled "Consciousness:Where We Are At," in Consciousness, the new journal of our Society for Consciousness Studies. You can read the paper at the following url: http://www.conscjournal.org/wp-content/uploads/2017/11/CONSCIOUSNESSIB.pdf. September 4, 2017. Sixteen of my papers are now open access on Western's server: http://ir.lib.uwo.ca/do/search/?q=author_lname%3A%22Baru%C5%A1s%22%20AND%20author_fname%3A%22Imants%22&start=0&context=674312&sort=date_desc&facet=. July 28, 2017. Recommended reading: The Leap: The Psychology of Spiritual Awakening by Steve Taylor (New World Library, 2017). July 27, 2017. Recommended reading: Why Dissent Matters: Because Some People See Things the Rest of Us Miss by William Kaplan (McGill-Queen's University Press, 2017). May 5, 2017. Working on the annual update of my web site. The biggest change is to the Research Projects page. I dumped all the language about the old stuff that I had been doing in the past, which readers can interpolate from the publications list anyway, and focussed on my currently active projects. I also renamed the page "The Consciousness Lab" since my collaborators and I have been spending mucho hours down there. So, to see what we've been up to, just go to the research page. August 20, 2016. Transcendent Mind is currently #1 New Release in Popular Experimental Psychology on Amazon.com. August 15, 2016. My new book, Transcendent Mind, co-authored with Julia Mossbridge, is released for sale today. Please see my books page for more information. Enjoy! June 15, 2016. My thesis student, Paula Rayo, received the Department of Psychology Thesis Award during convocation ceremonies yesterday for her thesis "Surrendering to the Vine of the Soul: Ayahuasca Shamanism as a Logotherapy." She spent four weeks at a retreat centre in the Amazon gathering questionnaire and interview data, and found that participation in ayahuasca ceremonies was correlated with increased existential meaning. May 20, 2016. My new book, co-authored with Julia Mossbridge, titled Transcendent Mind: Rethinking the Science of Consciousness, published by American Psychological Association Books has a release date of August 15, 2016 but is now available for pre-order from the publisher APA Books, from Amazon.com, and from Amazon.ca. Enjoy! May 2, 2016. Recommended reading: Living in Denial: Climate Change, Emotions, and Everyday Life by Kari Marie Norgaard (MIT Press, 2011). April 27, 2016. Recommended reading: Subtle Activism: The Inner Dimension of Social and Planetary Transformation by David Nicol (State University of New York Press, 2015). March 7, 2016. Recommended reading: The Man Who Could Fly: St. Joseph of Copertino and the Mystery of Levitation by Michael Grosso (Rowman & Littlefield, 2016). January 7, 2016: Recommended: https://carlossalvarado.wordpress.com/2016/01/07/paramooc2016-new-series-of-lectures-about-parapsychology/. June 9, 2015: Recommended reading: Your Inner Will: Finding Personal Strength in Critical Times by Piero Ferrucci (Jeremy P. Tarcher, 2014). March 13, 2015. Recommended reading: Radical Remission: Surviving Cancer Against All Odds by Kelly A. Turner (HarperOne, 2014). December 26, 2014: Two undergraduate thesis students, a research assistant, and I gathered data at a Matrix Energetics seminar in Philadelphia on the weekend of August 18 to 20, 2012 as well as on a web site two months after the seminar. We have now completed analyzing the data and written a final report that has been published as a paper "Alterations of Consciousness at a Self-Development Seminar: A Matrix Energetics Seminar Survey" on pages 1064 to 1086 in Volume 5, Number 11 of the Journal of Consciousness Exploration and Research. There were 97 participants in the study. On the basis of self-report and behavioural measures, we found that participants appeared to experience reality as being more plastic than we ordinarily assume it to be while in an attentive, expanded, and emotionally positive state of being. We were unable to email 10 of the 97 participants with our final report, so if you are one of those participants, please let me know and I will get the report to you. Also, anyone who could like a copy of the paper, please send me an email with your mailing address and I will send you a copy. August 20, 2014: Tara MacIsaac included me as one of her eight scientists in her blog post "8 Scientists Contemplate the Place of Consciousness in Science" published this morning in Epoch Times. August 15, 2014: My talk at the Society for Consciousness Studies, titled "A Vision for the Society for Consciousness Studies," has been published as a Guest Editorial in Volume 5, Issue 6 of the Journal of Consciousness Exploration and Research. Anyone who would like to read the paper but cannot access the journal can e-mail me at baruss@uwo.ca. June 23, 2014: A short paper based on my talk "Questions about Interacting with Invisible Intelligences" has now been published in EdgeScience. Also, an edited part of the paper I gave last summer at the Franklin Wolff conference has been reprinted in Hypnology: The Journal of Hypnosis and Consciousness Research. Also, I gave a talk, titled "A Vision for the Society for Consciousness Studies" at the inaugural meeting of the Society for Consciousness Studies at the California Institute of Integral Studies on May 31, 2014. I have submitted the paper for consideration for publication and will post a note here if the paper is accepted for publication. April 25, 2014: One of my thesis students, Vanille Rabier, wanted to see if she could replicate Daryl Bem's retrocausal recall experiments in which participants exposed to a list of words practice a random selection of those words after doing a free recall task. The idea is to see whether the later practice affects the recall task. We did not find an effect. That was published as an article: "Failure to Replicate Retrocausal Recall" in the new American Psychological Association journal Psychology of Consciousness. The full reference is given on the publications page. On March 21, 2014, I gave a talk titled "Questions about Interacting with Invisible Intelligences" at the sixth Exploring the Extraordinary Conference held at Gettysburg College in Pennsylvania. For those who are interested, the substance of that talk will show up in future papers and books. Please note that I am on sabbatical for this coming academic year and will not be teaching or supervising undergraduate student theses. October 11, 2013: I was invited to give the keynote talk at the 2013 Franklin Merrell-Wolff Conference at the Great Space Center in Lone Pine California on August 10, 2013. My talk was titled "Learning to Forget: Reflections on Self-Transformation." That talk has now been published with the title "Learning to Forget: Deprogramming as a Precondition for the Occurrence of Non-Dual States of Consciousness" in the Journal of Consciousness Exploration and Research. To read it click on the following link: http://jcer.com/index.php/jcj/article/view/326/352. August 5, 2013: A logic paper written together with Robert Woodrow titled "A Reduction Theorem for the Kripke-Joyal Semantics" has been published online in the journal Logica Universalis. I will have offprints available once the print version of the journal hits the stands for anyone who would like one. May 8, 2013: My new book is out! I have put some information about it on my books page. I like the finished product. January 1, 2013: Just a couple of news items. The Russian-language version of my paper "What We Can Learn about Consciousness from Altered States of Consciousness" has been published with the title "On the Study of Consciousness" in Existentia: psihologija i psihoterapija, Volume 5, pages 88 to 113. Carlos Alvarado mentioned the English-language version of that paper in a recent blog http://carlossalvarado.edublogs.org/2012/11/26/imants-baruss-on-altered-states-of-consciousness/. And John Hunt has announced a launch date of March 29, 2013 for my new book: http://www.iff-books.com/books/when-impossible-happens. He is publishing it under his science, philosophy, and law imprint, Iff Books. It is already available for pre-order from Amazon.com and Amazon.co.uk at a reasonable price. Professor Gary Schwartz had this to say about the new book: "Sometimes the most convincing and meaningful data come not from the university laboratory but from the laboratory of personal life. Dr. Imants Baruss practices the integration of academic and self-science in an inspiring and compelling manner. This book stunningly illustrates how the trained scientific mind can help reveal the seemingly impossible in everyday life." August 2, 2012: I was invited to give a talk on April 28, 2012 at the California Cognitive Science Conference at the University of California Berkeley. That talk titled "What We Can Learn about Consciousness from Altered States of Consciousness" has now been published in the Journal of Consciousness Exploration and Research and can be read at: http://www.jcer.com/index.php/jcj/article/view/227. The paper is also being translated into Russian and will appear in the Russian-language journal Existentia: psihologija i psihoterapija. 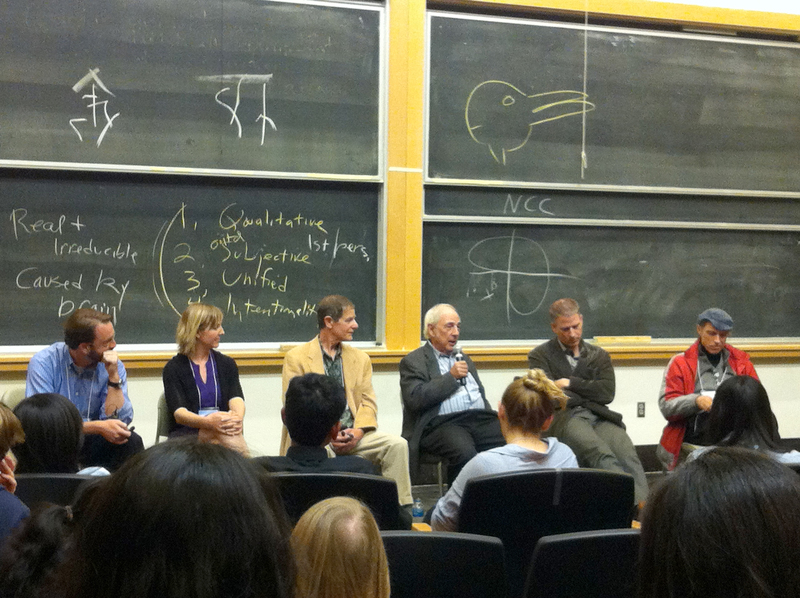 Here's a photo from the debate with John Searle holding the microphone (those are his notes on the chalkboard) and Christof Koch between Professor Searle and myself.